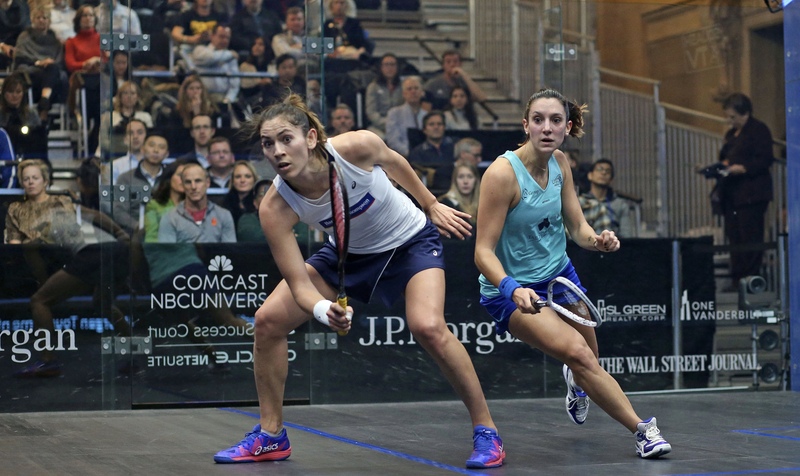 New Zealand’s Joelle King has become the only non-Egyptian to reach the semi-finals of the J.P. Morgan Tournament of Champions, PSA Platinum event after she overcame 2017 winner Camille Serme at New York’s Grand Central Terminal. King, 30, won her maiden Platinum title at her last PSA Tour event, the Hong Kong Open, and she moved to within one win of back-to-back finals after she recovered from an 11-1 defeat in game one to take the win in four games. El Welily overcame World No.8 Nouran Gohar by an 11-6, 11-9, 11-4 margin in just 28 minutes and is now one win away from an eighth successive PSA Tour final, a run which stretches back to last season. The other women’s semi-final will be a repeat of last year’s final as defending champion Nour El Sherbini and World No.3 Nour El Tayeb go head-to-head in an all-Egyptian battle. El Sherbini dispatched World No.16 Salma Hany, while El Tayeb overcame England’s Alison Waters, both in straight games. The final two men’s quarter-finals also took place, with World No.2 Ali Farag and 2017 runner-up Tarek Momen joining compatriots Mohamed ElShorbagy and Karim Abdel Gawad in the last four to make it an all-Egyptian affair. The semi-finals of the Tournament of Champions will take place tomorrow (Wednesday January 23). The women’s semi-finals get under way at 17:00 (GMT-5), with the men’s taking place at 20:00. All of the action will be shown live on SQUASHTV (rest of world), Eurosport Player (Europe only) and major broadcast channels such as BT Sport, Astro and Fox Sports Australia. 2019 J.P. Morgan Tournament of Champions, Grand Central Terminal, New York, USA..